When I traveled to the Bahamas a second time, I intended to go snorkeling again, but circumstances demanded that I take part in another excursion. So I traveled to a place called The Garden of the Grove. A pleasant trip all around, with its peaceful blue and white chapel and minimal installations such as a wooden abstract cross and other small framed artworks. Not sparse, but not outlandish either. This garden also contained a diverse sequence of sculptures, both abstract and Classical in execution. Flowers, trees, and other varieties of leafage frame the sculptures depicting regal women such as the Virgin Mary and Queen Victoria. I love how they all capture different moods. Mary is welcoming, Victoria is stern, but the remaining ladies (didn’t catch their names, so feel free to let me know who they are) either frolick or float. I think the woman as captured in wood and painted in white is probably my favorite. She was near the blue and white chapel. The way she looks as though she is floating and how her face is defined only by that gap gives the grove this supernatural atmosphere. 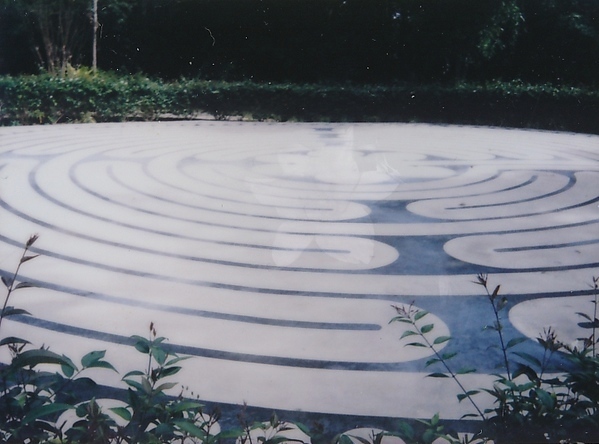 Lastly, not only do they have a blue and white chapel, they have a blue and white labyrinth. This place acts as a sort of wonderland where you can imagine mythological beings known for mischief and games hide and frolic about. You find more of my photos of the Grove here.